I'm always on the lookout for a way to make a tart, funky beer that doesn't have to age for... ages. While many saisons disappoint me, a handful that I've tried in the last year really opened my eyes to just how glorious the style can be, when approached the right way. Hill Farmstead makes the best American saisons I've had: tart, juicy, sour, but still distinctly saisons. Fantome makes perhaps the best saison I've ever had, and without a doubt the most unique. All come with a healthy layer of dregs at the bottom of the bottle. What else is a homebrewer gonna do? I decided to follow the same double-batch process I used for my two black sour ales, in which I brewed the same recipe twice, but pitched different dregs to each. Both of these base saisons were brewed a day apart, and both were also pitched a 1000 ml starter of White Labs Saison II yeast, which took off like nothing I have ever seen before. Seriously, the Hill Farmstead version had a thin krausen and a slowly bubbling airlock within three hours of pitching — basically while I was still cleaning up from brewing it. I guess this was a combination of overpitching (between the starter and dregs, I realized I probably gave it a bit more yeast than was necessary for such a low gravity beer), and pitching an inherently aggressive yeast fresh from a stir-plate. Why pitch a commercially available saison strain alongside the highly unique dregs I had at my disposal? Well, for one, I was not trying to clone any of the beers I harvested from. My goal was simply to brew two unique petite saisons, and also to get a feel for the fermentation schedule of a beer like this, which ideally will not have to age for a year or two, as a lambic would. Also, pitching exclusively dregs from a sour or funky beer would be risky, as you can't be sure that you'll be pitching a health dose of Sacch, or at what ratio, and so forth. With a full-on sour beer, this isn't so much of an issue, but with these, well... I wouldn't really be brewing a saison if saison yeast were only a minor, unhealthy remnant of the microbes I pitched, you know? Anyway, I loved the smell coming off my Saison II starter, and I suspect I'll really enjoy this as a saison yeast — that is, if I can pick out its character from the dregs. For this version, I was fortunate enough to be able to harvest dregs from a couple bottles: Hill Farmstead's Juicy and Clara. My standard procedure for culturing dregs from beers like these is to, 1). drink the beer, obviously, 2). sanitize the lip of the bottle, and a small sheet of tinfoil, 3). pour about 10 ounces of low gravity wort into the bottle, then cover it with tinfoil and rubber-band the tinfoil over the neck. Shake, and let sit. Both seemed to contain a mixed culture of microbes, as both bottles quickly, aggressively formed pellicles — in fact, more aggressively than any of the actual sour dregs / bottles I've cultured. While it's generally bad form to guess at microbes based on the pellicles they form, here are my guesses anyway. Clara was tart and juicy, and mildly sour, but I don't remember any significant Brett character. I'm assuming Clara was fermented with saison yeast and lactobacillus, though it's quite possible Brettanyomces was in there too. Juicy tasted less like a saison and more like a 'regular' barrel-aged sour beer, and given my sensory perceptions and the description given by Hill Farmstead, I'm fairly certain contained a full mix of microbes. At least, definitely lactobacillus and Brett. In any case, between the two cultures, there should be a nice healthy mix of funking and souring agents. The real question for me is how long the beer will take to finish. I'm hoping this will be the sort of wild ale that, thanks to the aggressive saison yeast and low original gravity, will hit terminal gravity within a month or two, and can be bottled young, but will continue to develop sourness as it ages in the bottle (hopefully without risk of over-carbing). The contents of Fantome remain much more of a mystery to me than the Hill Farmstead beers I cultured. Everything about this beer is elusive. Based on taste: I have no idea. Fantome does not taste like any other beer I have ever tried. Lactobacillus is again probably a safe bet, and there almost has to be some wacky Brettanomyces strains in there. A reliable source tells me that, based on a conversation with Shaun Hill, both Hill Farmstead and Fantome start out with the same saison yeast strain. If that's true, it's rather remarkable, being that the beers from each brewery taste nothing alike. Online, it's rumored that Fantome is blended with a small portion of lambic after fermentation, with sources citing emails from brewer Dany Prignon himself. If true, one might think that brewing with the dregs from Fantome would just result in a lambic — so we'll see. The character of Fantome is so unique, I don't care what happens with it as long as the product is half as interesting as its source. Interestingly, the bottle of Fantome dregs did not take off nearly as aggressively as any of the Hill Farmstead cultures. While it did seem to ferment, slowly (I never took a gravity reading of the starter, hence "seemed to"), it never formed a pellicle. However, given the aggressive character of the beer and the large pile of dregs at the bottom, I would surprised if I didn't get, at least, some Brettanomyces from it. Despite the rapid and aggressive fermentation of both beers, the airlocks on each bubbled at a steady pace for a few weeks after brew-day. Three weeks later (on 3.3.2013), I took my first gravity reading of each beer, and was surprised to find the gravity still at 1.007 (Hill Farmstead version) and 1.009 (Fantome version). Here I was worried about over-pitching, and the beers hadn't even reached the terminal gravity I would expect with just the Saison II strain. Considering that I definitely didn't under-pitch, I aerated as I normally would, I mashed at a middle-ground 151 degrees, and I've been keeping the carboys at a constant, cozy 72-74 degrees, what would explain this? Many saison strains are notorious for taking a long time to finish, but the description from White Labs for Saison II says that it "ferments quickly" and has an attenuation range of 82 - 88%. Seems a little off. I checked my hydrometer afterwards, to make sure I wasn't just getting a bad reading, but no issue there. Hmm. However strange, the first gravity samples definitely taste great. The Fantome sample is a bit more funky and less tart, as expected. Basically, it tastes like a nice, light saison so far, with perhaps a bit of funky Fantome character emerging. The Hill Farmstead version, also unsurprisingly, is more tart, acidic, and juicy, and has a nice, bright sourness to it. Both beers are still bubbling, and presumably still fermenting, not stuck. If there was just saison yeast in play, I might be a little worried about the gravity, but with the dregs at work, each will hopefully reach the low terminal gravity I'm aiming for. Also, I wasn't planning on bottling these saisons for a few months anyway, and ideally, the slow-moving Sacch yeast will just give whatever else is in there more to chew on. Nice experiment. I've very recently been able to get my hands on a couple bottles each of the Fantome Saison, Black Ghost, and Pissenlit, and was thinking of trying something similar. I brewed a "Super Saison" a while back and racked about 2 gallons of it into secondary, on raspberries, and pitched some Fantome dregs. Left it for a few months. Interesting beer, to say the least, but I'm not too sure what the Fantome added to it. The gravity was already at 1.004 when I added the dregs and fruit; got down to 1.002 three months later. I'm jealous if you have fairly regular access to Hill Farmstead beer! Nice! With that many bottles, you almost have to harvest the dregs. I do wish I had had a few more myself to crop from. I'm wondering now how old my bottle was, now, but I can't find any sort of date stamp on the label. Did that super saison ever develop any of the weird funk that's in Fantome? Did it get sour? It's a 6 hour (one-way) drive to Hill Farmstead for me, so "fairly regular" might be a bit of a stretch, haha. But it's certainly doable and enjoyable as a weekend trip. I've only been there once, but one of my good friends brought a bunch of stuff (including these saisons) back for me in the fall, too. Hopefully another trip will be in order this spring sometime. I've only been drinking the raspberry/Fantome portion for a bit, now. I wouldn't say there's much funk... yet. Definitely not sour. And it may stay that way, but I'm interested to see if it goes anywhere. Unrelated: I brewed a Flanders Red in Feb, 2011... it sat in primary for 15 months. Bottled half, put half on cherries for another 3 months. Both had various Cantillon and commercial FR beer dregs... now THOSE are sour! But not near as drinkable as Fantome! I still envy you being 6 hours away! And if you're ever looking to pick up extra, let me know! 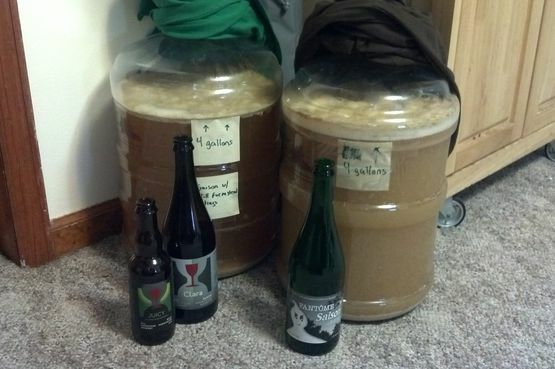 I just (last Sunday) brewed a saison from the dregs of HF Arthur. I'm so far from HF that I knew I had to seize the opportunity! I stepped up the culture once, and pitched, noticing activity within a few hours. I'ts been rolling along for two days now - strong fermenter. Hmmm. Great minds brew alike I guess. We each brewed with belma around the same time, too. Cheers! Interested to see how your HF saison comes out. Nice! It sounds like you just pitched the dregs by themselves? The HF dregs were so vigorous that I debated doing that too, I'm not surprised you're seeing a strong fermentation. It'll be very interesting to see what differences may arise from having pitched only dregs vs. dregs + commercial yeast! Yup, dregs only. I stepped up a starter from culturing the dregs for a few days. Honey + water (all I had) and dregs stepped up to a standard DME starter (1c DME, 1 Qt. water). Made the starter 24 hours before pitching. If it turns out well, I'd be happy to share a bottle. Sweet, doing a bottle swap would definitely be fun. I built up my poor man's "house culture" by pitching a bunch of Fantome and Jolly Pumpkin dregs into a 1-gal beer and have been washing and reusing portions of the resulting yeast cake. They're turning out great wild beers, sour with lots of cherry and not too much horse blanket. Good to hear. I'm definitely going to be saving the yeast cakes for future projects once these are done. Great experience! I just brewed the exact same recipe today, with one bottle of Fantome in one fermenter, and one bottle of HF Clara in an other fermenter. One thing was a bit off compared to you : I left the dregs of my two bottles 48 hours with a 10 oz low gravity wort, but I did not see any activity at all. Still, 4 hours after pitching into the wort, there is some activity on both fermenters. One question for you : why pitching the dregs and the WL Saison II at the same time? Putting the dregs only in secondary would allow more funky/sour flavours to appear, don't you think? Awesome, very curious to hear how yours comes out and if the results sound similar! I'm sure the results of adding the dregs in secondary would be interesting too, and it's hard to know which one would work better without trying it side-by-side. Could be worth an experiment! Hey man, love the blog. While I see this is an older post, just thought I'd let you know that RVA yeast labs has released the sacc saison strain from fantome (RVA 263). There is essentially no info about it other than a brief description, and it's one of those expensive dont-need-to-make-a-starter pitches. I picked it up yesterday on a whim, I guess we'll see what happens! That's good to know. I hadn't really checked out RVA before. Let me know how it turns out when you brew with it! Sorry.... I meant to inquire about the efficiency on this recipe.